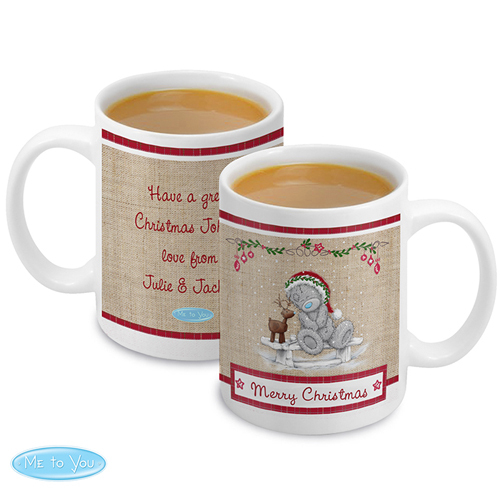 This Christmas Me to You mug is perfect for your Christmas night hot chocolate. Personalise the front of this 'Me To You' Reindeer Mug with a message up to 20 characters in length. On the reverse you can add a further message over 4 lines of 20 characters per line. All personalisation is case sensitive and will appear as entered. What's more, this fantastic gift can also be made and despatched in 24 hours. Next day delivery may be available. Personalise with a message up to 20 characters in length. On the reverse you can add a further message over 4 lines of 20 characters per line.